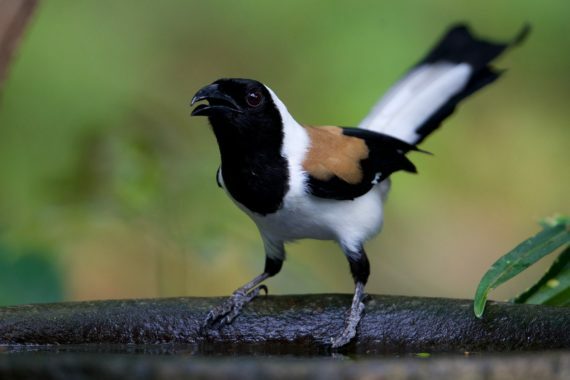 The sixth GBBC in India saw over 14,000 lists from almost 1,500 birders racking up over 8,000 person-hours birding and recording 825 species during the 4-day event. Birders covered 271 districts in all kinds of ecosystems (forests, wetlands, grasslands, etc), from national parks and sanctuaries, to agricultural regions, and urban habitats as well. The numbers are described in more detail below; but the human stories behind the numbers are even more important! So please do also read various accounts from some of the participants across the country. A huge thank you to the state coordinators and those who organised counts on campuses and elsewhere around the country. GBBC/CBC at the Indian Petroleum Institute, Dehradun. Photo: Raman Kumar. The global Great Backyard Bird Count takes place over four days (Friday to Monday) around the middle of every February. The idea is to twofold. First, to create a snapshot of what birds are where at this time, by encouraging people to go birding, record what they see, and share their observations on the eBird website. Second, to use the global event to get more people excited about birds: to watch and conserve them. As has been the trend over the previous five events, 2018 saw in increase in GBBC birding in India from the previous year. As in 2017, this year India was third globally in terms of the number of checklists submitted, behind just the United States and Canada. In terms of species, India’s total of nearly 840 represents 64% of the total species known to occur in the country, and an increase over last year. However, we have dropped in the species rankings from #2 to #4 because of the strong showing by Ecuador and Brazil, both super-rich countries in terms of bird species! Top countries by species reported. The only way to try and rise in the species rankings would be to have a specifically planned effort across the country to find and report range-restricted species. But really the GBBC is more about the participation than the species numbers! NB: Number of lists and species shown by the GBBC website differs from those used for analysis, as the GBBC total includes only lists uploaded by a cut-off date of 3rd March, while GBBC India analysis has considered all lists uploaded by 15th March. GBBC birdlists came from 29 states and union territories: almost the entire country! Each list in the map to the right is shown as a translucent circle, hence darker areas represent multiple lists from the same or adjacent locations. Although GBBC reports are of limited use to actually determine population and range trends, it is always interesting to look at the “commonest” species. Overall House Crow was the most frequently reported species, appearing on 46.8% of ‘complete’ lists, very similar to last year’s figure of 48%. When the country is categorised into four broad regions, different sets of species may show up as commonest in different regions. 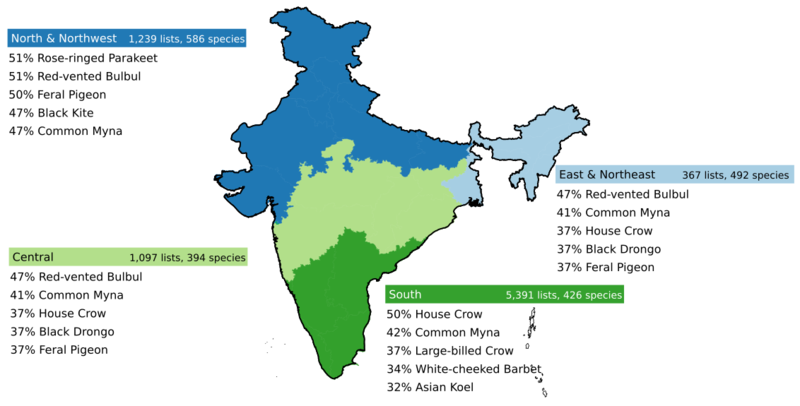 As with the last two years, Common Myna is the only species to occur in the top five for all four regions, with Rock Pigeon, Red-vented Bulbul and House Crow all making the top five in three of the four regions, precisely as last year. Common Myna was reported from almost every corner of the country during GBBC 2018. The top three birded states in terms of number of lists were the same as last year, with Tamil Nadu replacing Kerala at the top spot. Uttarakhand replaced Maharashtra at #4, and Madhya Pradesh came in at #5, a large jump from last year, when it was placed at #15. Nine States reported over 300 species during the four-day event. The number of lists and species per state are shown in the graph below. Number of birdlists and species reported, by State. Nationally 1,491 registered eBirders took part and recorded at least one list. In reality many times this number birdwatched during GBBC, especially through the various organised bird walks and the Campus Bird Count. The table below shows the top participants (including some group accounts) per state/union territory, based on number of complete lists recorded. Some people get especially addicted to birding during GBBC, spending most of the daylight hours out looking for birds! The top dedicated GBBCers (based on number of complete lists and total birding hours) are shown below: thanks very much to them for their efforts. This dedication is recognised globally, as the top twenty participants in the world in terms of checklists submitted is filled with Indian individual or group accounts! 2018 saw a large number of associated events during the dates of the GBBC. With over 60 bird walks and talks taking place all across the country, this was truly four days of all-round celebration of birds. From birdwalks for students in schools, colleges and universities, to public birding sessions at lakes and other habitats, and workshops & talks for beginners, a large number of members of the larger public were introduced to birding. The full list of registered events is here. GBBC 2018 was coordinated by Bird Count India and its various partners. For more information, see the following links. GBBC will be back on 15-18 February 2018! View the next page for the full list of 2018 participants.